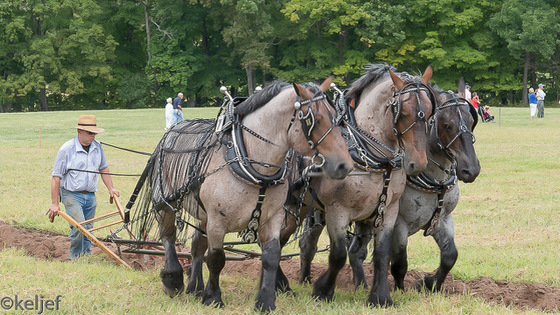 HOPEWELL TOWNSHIP, N.J. - Howell Living History Farm will hold its 35th annual Plowing Match on Saturday, Sept. 1, from 10 a.m. until 4 p.m. A dozen teams of draft animals from New Jersey, Pennsylvania, and New York are entered in the match, which tests the performance of farmers, their horses and oxen. Pony rides, wagon rides, an obstacle course driving competition and music by the Jugtown Mountain String Band are also planned. At noon, hungry plowers and visitors can lunch on roast pork sandwiches, a chicken BBQ, Kosher franks and local potatoes and sweet corn. Plow match judges, some of whom are traveling from as far as Virginia and Oklahoma to help with the match, will present trophies and ribbons to the winners of all classes at 1:30 p.m. Parking and admission are free. Rain date is Saturday, Sept. 8.